A place where art, medicine, social media and pop-culture collide and create a patient voice in health information technology. Yesterday, August 27 was the celebration of Jess Jacobs life in California. A few members of the Walking Gallery were able to attend. They represented the 396 members who could not be there. We all cherish her memory. The east coast friends of Jess gathered Saturday, August 20, to mourn her passing and celebrate her life. I came to Whitney’s house in my usual fashion with a hoard of supplies. I brought tables, chairs, paint, brushes, and glitter. We were going to make unicorn art. I also brought a lot of box tops for education to cut out and prepare to mail to raise funds for my son Isaac’s school. When someone is very sad it helps to keep very busy. In Whitney’s back yard the cicadas hummed and I stood presiding over a table of industrious friends of Jess. We painted Unicorns and taped down box tops. We added glitter and told stories of a life. Many people came over to our table to trace and paint unicorns. One of those people was Ross Martin. He decided to freehand draw his unicorn in ink. He said he would come back to finish it. The afternoon progressed, more paintings were completed, and more stories were told. Soon it was time to thank Whitney and leave. I packed up my cacophony of art. I hugged Ross goodbye. He said, “I did not get to finish my unicorn.” I said that was okay. It would be incorporated in a larger piece. We don’t always get to finish what we start, but our friends will carry it on. I put all the unicorns together into one piece of art. I mailed that painting to Jess Jacobs’ family. It should get there next week, after the celebration is over, after friends will go home. It will come in the quiet time. It will represent our oath to tell her story, to finish what she started. I have been keeping busy for a very long time. There is no other voice like yours. I'm just so honored to read what you see and express. Thank you for everything you share. The same to you dear friend. The Walking Gallery of Healthcare from Eidolon Films on Vimeo. Regina Holliday is an activist, artist, speaker and author. She speaks about the benefits of health information technology and timely data access for patients due to her family loss. 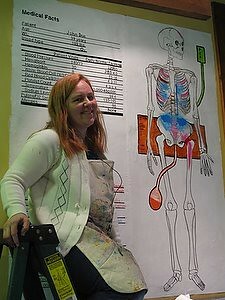 In 2009, she painted a series of murals depicting the need for clarity and transparency in medical records. This advocacy mission was inspired by her late husband Frederick Allen Holliday II and his struggle to get appropriate care during 11 weeks of continuous hospitalization at 5 facilities. Her paintings became part of the national debate on health care reform and helped guide public policy. 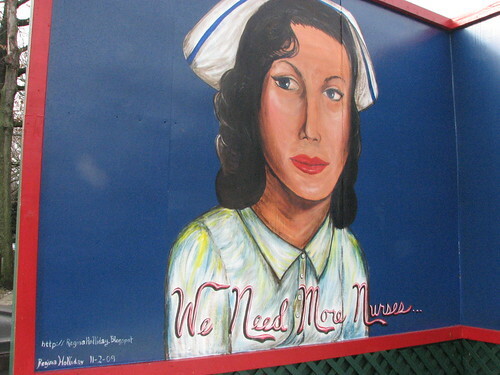 She also began an advocacy movement called “The Walking Gallery.” The Gallery consists of medical providers and advocates who wear patient story paintings on the backs of business suits. #Cinderblocks2: Our agenda as it grows in real time. How do you join The Walking Gallery?